I received this from my mother in law. She doesn't know what it is, only that it was given to her by someone when they were in Texas. 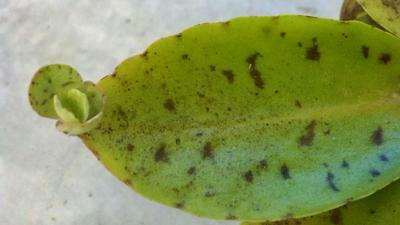 The "leaves" are a bit waxy and there is new growth forming on the ends. Hi Kelly, any time you see this trait of small plants forming on the leaves it's a dead giveaway as to the genus that the plant belongs to. There are only a few types of plants that show this characteristic. 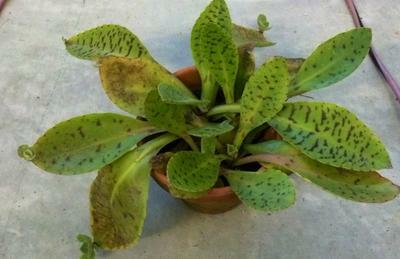 This is one of the many Kalanchoe species which can be propagated this way; you can see more here: Donkey Ears. Thanks, Jacki!! That helps tremendously!! So, I noticed that the leaves with "babies" seemed to dry up and shrivel. Is that normal? All of the other leaves look fine. I did repot it, and pulled the babies off of the dried up leaves and repotted those separately. Just wondering if it is normal for the leaves to do that. Hi Kelly, I have never grown this plant, but it makes sense that the leaves would die; after all, producing babies is hard work! Think of the plant as making seeds - some plants will die after this process has taken all their energy, leaving room for the next generation.